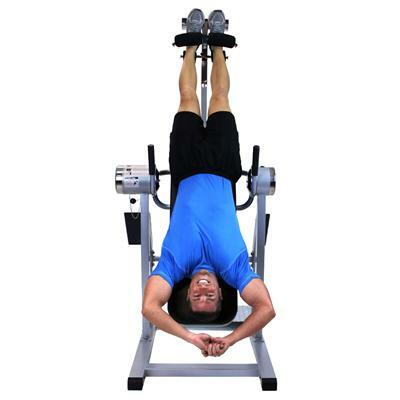 The Power VI Inversion Table with Gravity Lock helps to achieve functional fitness, offering joint decompression in the form of mild stretching and relaxation as well as more active core training for improved strength and flexibility. Ideal for multi-user environments, the convenient one-button control takes the guesswork out of a workout, eliminating the need for user-specific adjustments. Simply secure the ankles and push the button for smooth and controlled rotation. 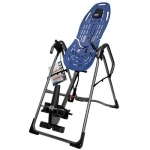 Backed by independent certification to the strictest standards available, Teeter Hang Ups® power inversion tables are UL Listed 1647 for motor-operated exercise machines. Independent Quality-Assurance Tested to Highest Safety Standard: Voluntary compliance to UL’s inversion table safety standard makes Teeter Hang Upsâ the only inversion brand with certified quality. Push-Button Control: The most user-friendly inversion table on the market rotates with just the push of a button. No User Setting Adjustments Necessary: Ideal for multi-user environments, the convenient one-button control eliminates the need for user-specific height or weight settings. Capable of 0° to 90° Inversion: Teeter offers the only motorized inversion tables capable of full inversion that can be stopped at every rotational angle. Interlocking gears allow the Power VI to remain fixed at any angle, providing a sturdy platform for workouts. Optimum Decompression Surface: The firm foam surface remains comfortable, reducing friction and allowing the body to slide and achieve the optimum decompressive stretch. 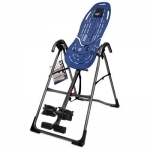 Deluxe EZ-Reach™ Ankle System: The extended handle reduces the user’s need for bending. Constructed of aerospace-grade stainless steel parts, the gravity lock prevents opening of the ankle clamps when inverted. Convenient Hand Grips: Durable coated handles provide support while mounting and can be used as a “traction handle” for additional stretching and decompression while inverted. Stable Base with Floor Protection: The oversized square-tubing base features non-skid floor guards to reduce sliding on hard surfaces and protect floors. Quick and Easy Assembly: 90% pre-assembled. Manual Overide Option: Includes a back-up rotation option in the event of power failure. 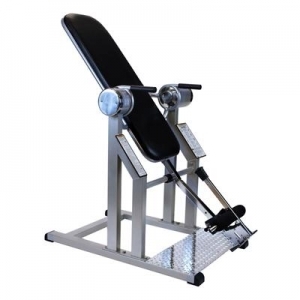 Instructional Plaques: Durable ABS plates are displayed on the equipment to provide every user with detailed instructions on product use as well as inverted stretching and exercises. Training Support: Comes with an instructional training manual.